Over the years of working with people with Hashimoto’s, I have learned that most people will experience pain on some level. For some, it may manifest as a chronic condition, such as migraines or joint pain. In other cases, people may experience gastrointestinal pain that comes and goes. 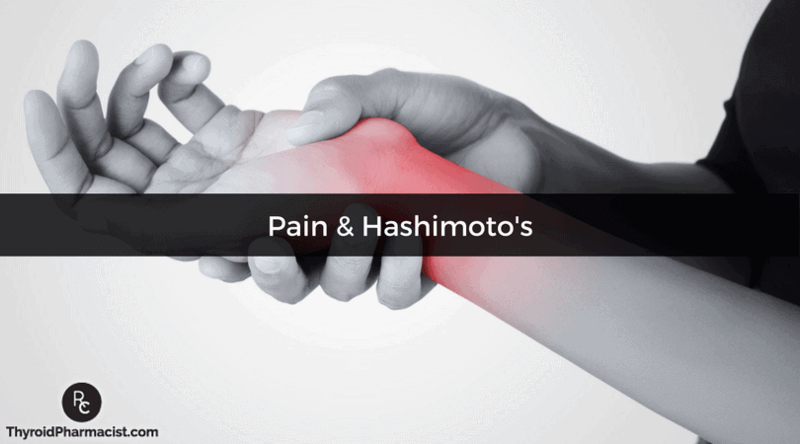 When I was first diagnosed with Hashimoto’s in 2010, I struggled with pain in the form of body aches and stiffness, as well as carpal tunnel in both arms. To deal with the pain and get through my workday, I took NSAIDs (painkillers) every day… before eventually getting to the root cause of my thyroid condition and making diet and lifestyle changes. These interventions alleviated my pain within weeks. As a pharmacist, I certainly understand the value of pain medication and other conventional therapies in the right context. However, I also know that getting to the root cause of why we have pain, and treating the trigger itself — often through natural methods — can be more effective at providing a long-term resolution to pain. Each pain disorder requires a unique, comprehensive treatment plan, as pain is a complicated and multifaceted issue, with many potential root causes — and therefore, many potential treatments. For example, a person may be in pain because of an injury, migraines, a structural abnormality, nerve damage, fibromyalgia, an autoimmune process, or because of an increased sensitivity to their environment. While pain may have various root causes, and some types of pain may require physical rehabilitation and other incredibly helpful conventional treatments, the most common conventional approach to treating pain is through the use of surgery and pharmaceutical pain medications. While this is not meant to be a complete review of the conventional approach, I’ll mention some of the more common options I’ve seen as a pharmacist. The use of opiate medications is a constant source of controversy. On one hand, they are overused, and often lead to addiction and health problems. On the other hand, for people who are terminally ill or seriously injured, opiates are often necessary and serve an important purpose in alleviating severe pain. Opiates work by disconnecting the pain receptors in our brain from the pain signals themselves, making us “forget” that we’re in pain. While these medications are effective “band-aids” for pain relief, they can also be habit-forming for many people. The potential side effects of opiates include sedation, dizziness, nausea, vomiting, constipation, physical dependence, and respiratory depression. Over time, people can build up a tolerance to these drugs and require increasingly large dosages to counteract pain, leading to dependance, increased side effects and even death from overdosing. Sadly, in 2017, over 47,000 people died in the United States from drug overdoses due to opiates. In some cases, people overdose on prescription drugs, while in other cases, they may turn to street drugs due to addiction and needing a stronger drug. A dear friend from high school became addicted to opiates after a sports injury while playing college football and lost his life to a fentanyl overdose, so this subject hits close to home for me. Despite their habit-forming potential and potential for serious side effects and even death, a growing number of people are being prescribed opiates. Interestingly, Synthroid was the number one prescribed drug in 2013 and 2014 in the United States. In 2015, Synthroid dropped to number two and was displaced by Vicodin, an opiate painkiller. As a pharmacist, the irony is not lost on me that in many cases, addressing inflammation could prevent the use of both of these medications. NSAID medications (Non-Steroidal Anti-Inflammatory Drugs) are often a first line treatment for pain disorders. They help with reducing pain and inflammation by preventing an enzyme called cyclooxygenase (COX) from creating hormone-like chemicals called prostaglandins — one of the greatest contributors to inflammation in the body. Unfortunately, they are also associated with numerous side effects, most significantly gut dysfunction, which can lead to an increased likelihood of ulcers. For short-term use, such as the occasional headache or acute injury, NSAIDs can be very helpful. However, the longer we take them, the more likely we are to suffer adverse reactions. Most medications have their time and place. As a pharmacist who is trained in both medication therapy management and functional medicine, I believe that instead of glorifying or demonizing medications, health professionals and patients need to be educated about appropriate medication use, along with complementary therapies that can eliminate or reduce the need for medications. Surgical intervention is sometimes necessary in addressing pain. However, it is more likely to be used in the case of acute pain (such as a broken bone) rather than chronic pain. Oftentimes with chronic pain, the source is difficult to identify. A surgeon can’t operate if they don’t know what to “fix.” However, there are some circumstances in which the source of pain is identifiable and surgery is an option, usually as a last resort when other solutions have failed. An example of this would be a herniated (ruptured) spinal disk that presses on the sciatic nerve and causes chronic sciatica. Surgery to remove part of the offending disk (called a discectomy) may be performed to relieve the pressure and, thereby, the source of chronic pain. Though surgery might be the best option in certain circumstances, the risks of surgical and invasive procedures are not minor. They include permanent injury to the body, psychological stress, and time, cost, and productivity losses. In some cases, steroids can be used to reduce pain. Most steroids are synthetic forms of cortisone (a hormone naturally made in your adrenal glands) and include prednisone, methylprednisolone, prednisolone, dexamethasone, and hydrocortisone. These come in many forms, including pills, topical creams, and injections. Steroids decrease inflammation by reducing the production of inflammatory chemicals in order to minimize tissue damage. This might be particularly helpful in conditions such as rheumatoid arthritis, where chronic inflammation causes painful swelling in the tissue surrounding the joints. However, as with all medications, steroids do come with negative side effects, and these side effects increase with dosage. In other words, most of the negative consequences that come from using steroids are a result of long-term use for managing chronic pain. These side effects include adrenal insufficiency (altered response to physical stress), steroid withdrawal syndrome (fever, fatigue, and joint pain), infection (steroids depress the immune system), gastrointestinal ulcers and bleeding, osteoporosis, weight gain, depression, insomnia, elevated blood pressure, blood sugar imbalances, cataracts and glaucoma, elevated risk of heart disease, and even bone death (aseptic necrosis). While there are some short-term circumstances in which steroids can be very helpful, they don’t address the root cause of pain itself, and may create more health consequences down the road. What we know is that pain medications, surgery, and other conventional approaches don’t get to the root cause of the pain condition, and thus, we need to take a comprehensive approach to reducing pain in the body. Inflammation is always a factor with Hashimoto’s, as thyroid disease itself involves inflammation of the thyroid gland. When inflammation occurs, the body’s white blood cells release chemicals into the affected tissues to protect the body from what it sees as foreign substances. In autoimmune disease, the body views part of its own body as a foreign invader and stages an attack, resulting in inflammation. In most cases of Hashimoto’s, where the body attacks its own thyroid cells, the inflammation is not limited to the thyroid gland, but can manifest anywhere in the body. When we experience pain with Hashimoto’s, inflammation will oftentimes be at the root, and reducing inflammation in our bodies will always help reduce pain and promote healing. While NSAIDs do reduce inflammation in the short term, they won’t get to the root cause, and the pain will return. Instead, there are several natural approaches that have been shown to be effective without the unwanted side effects. Many of these solutions will target the reason that inflammation occurred in the first place, and may eliminate pain altogether. Magnesium – People with Hashimoto’s are at risk for being deficient in magnesium, which can lead to a long list of symptoms, including headaches, joint pain, leg and hand cramps, and menstrual pain. In my own case, I noticed a dramatic decrease in menstrual cramps when I began taking a magnesium supplement on a daily basis. Omega-3 Fatty Acids – Omega-3s are a powerful ally against pain, intestinal permeability, and most conditions associated with inflammation. Additionally, omega-3 fatty acids can help manage oxidative stress, which often goes hand-in-hand with chronic inflammation associated with Hashimoto’s. Research has even shown that compared with the over-the-counter NSAID ibuprofen, omega-3 essential fatty acids could equally reduce arthritic pain, and be a much safer alternative for long-term pain reduction. B Vitamins – Various B vitamins can help with different types of pain. B12 can help neuropathic pain, when taken in high doses of 40 mg/day. Vitamin B6 or the active form, P5P, taken at a dose of 100-200 mg/day, can relieve carpal tunnel syndrome, while B1 (thiamine), at high doses of 600–1800 mg/day, can help with pain from fibromyalgia. In addition to addressing nutrient depletions to reduce pain associated with Hashimoto’s, many symptoms can be helped by making dietary changes. In May of 2015, I conducted a survey of my readers to find the most helpful interventions for those with Hashitmoto’s. The results showed that many people experienced a reduction in pain by finding and eliminating foods that were causing excess inflammation and contributing to leaky gut. Eliminating Nightshades: In my survey, 62 percent of people reported that removing nightshade vegetables from their diet helped to reduce their pain. Nightshades include: tomatoes, potatoes, bell peppers, eggplants, tomatillos, Goji berries, and the herb ashwagandha. (Note: Even if you’re not in pain, hot, capsaicin-containing peppers have the propensity to cause leaky gut, so they too could potentially contribute to autoimmunity.) I recommend trying a nightshade free diet for two weeks, to see if that makes a difference for you. Low FODMAPs Diet: In my survey, 48 percent of readers saw an improvement in pain by following the low FODMAPs diet. This diet, typically used for irritable bowel syndrome (IBS), reduces the consumption of specific fermentable carbohydrates that can contribute to intestinal distress. For more information about the low FODMAP diet, you can visit the Monash University site, and stay tuned for a new article from me about FODMAPs in the very near future! Autoimmune Paleo Diet: 50 percent of people reported a reduction in pain when following the Autoimmune Paleo (AIP) diet, which removes gluten, dairy, soy, grains, nightshades, legumes, nuts, seeds, and eggs — common food sensitivities for those with Hashimoto’s. Low Oxalate Diet: Oxalates are substances that are found in some foods. They are also waste products made by our bodies, and excreted through our kidneys. Studies have shown that oxalates may contribute to Hashimoto’s. Symptoms of oxalate sensitivity include joint pain, pain in the body, and pain with urination, among others. A low-oxalate diet may provide relief from pain for those who have a sensitivity. Additional diets that were reported to reduce pain, in my May 2015 survey, include the gluten free diet (47 percent), the grain free diet (43 percent), as well as an egg free diet (40 percent). Another factor for many in overcoming pain can be addressed by treating infections, a common root cause of Hashimoto’s. In 2015, 80 percent of my clients who hit a plateau with nutrition and took the gut tests I recommended, tested positive for at least one gut infection. The infection I have encountered the most in people with chronic pain and migraines is Helicobacter pylori. When combined with the use of NSAIDs, this infection (most commonly known for causing ulcers) creates a double whammy risk for ulcers. Treating this gut infection helped reduce pain for 50 percent of the people I surveyed. Please see my article on H. pylori for information on how to test for and treat this infection. Small intestinal bacterial overgrowth (SIBO) is another infection that is common in Hashimoto’s. SIBO is an overgrowth of bacteria in the small intestine that leads to a variety of gastrointestinal symptoms and is often times associated with irritable bowel syndrome (IBS). Treating it helped 51 percent of people in my survey reduce their pain. Additional infections that I often see in people with Hashimoto’s include Candida (yeast) overgrowth, Blastocystis hominis, and reactivated Epstein-Barr virus. Testing for and treating these infections, which are at the root cause of many cases of Hashimoto’s, may eliminate the pain symptoms that result from them. Turmeric – Up to 65 percent of people reported a reduction in pain by taking a curcumin or turmeric supplement. Turmeric has a long history of reducing inflammation, and curcumin (its active component) has anti-inflammatory benefits that can be helpful in down-regulating autoimmune conditions. It has been found to reduce joint inflammation in rheumatoid arthritis, and has therapeutic anti-inflammatory effects for a variety of gastrointestinal conditions, including Crohn’s disease, ulcerative colitis, and irritable bowel syndrome. Adding this spice to your cooking, or adding a curcumin supplement to your regimen, may help relieve a variety of pain symptoms associated with Hashimoto’s. Betaine with pepsin – Another 40 percent of people with Hashimoto’s reported a reduction in pain by assisting their digestion with the use of betaine with pepsin. At first, this caught me a bit off guard, but the more I thought about the mechanism of action, it made perfect sense. Betaine (also known as trimethylglycine) and pepsin (naturally occurring components of gastric juice) break down protein bonds in food, thereby aiding digestion, reducing intestinal inflammation, and even leading to reduced systemic inflammation and less pain for many people. Trimethylglycine (betaine) can also be helpful for breaking down homocysteine, which has been associated with inflammation. Furthermore, it can increase the amount of SAMe, a naturally occurring substance with mood-boosting and pain-relieving properties, within the body. Wobenzym – This systemic enzyme has been shown in studies to significantly decrease the levels of both anti-TPO and anti-TG antibodies in Hashimoto’s patients. Some people have found that this led to a reduction in pain associated with their thyroid symptoms. In recent years, a few new technologies have emerged that may offer relief from pain without many of the negative side effects associated with conventional therapies. Check with your care provider to see if any of these therapies might be of benefit to you. Cold Laser Therapy: Also known as Low Level Laser Therapy (LLLT), cold laser therapy utilizes specific wavelengths of light to interact with tissue, in order to help accelerate the healing process. It can be used to alleviate a variety of acute and chronic conditions, which can help eliminate pain and inflammation. Cold lasers are handheld devices that are placed over the affected area of the body by a clinician. Non-thermal light that emits from the laser passes through the layers of skin and is absorbed by the body’s cells. When our cells absorb this energy, it is theorized that damaged or injured tissue can be normalized, resulting in reduced pain and an increased rate of healing in the damaged area. Platelet-rich plasma injections (PRP): This therapy utilizes a process in which blood is taken from a patient. The platelets are then removed before being reinjected into the affected site of that same patient, to accelerate the healing of injured tendons, ligaments, muscles, and joints. PRP therapy has emerged in recent years as a promising treatment for chronic pain, and has even been used post-surgery to speed up the healing process. PRP may benefit those suffering from arthritis, sciatic pain, tendonitis, carpal tunnel, and musculoskeletal pain. Getting to the root cause of your pain may take some time and experimentation. There are a number of holistic approaches to pain that can help you manage it while you look for your own triggers. They also provide many therapeutic benefits that make them particularly helpful when you are pursuing whole-body health. Acupuncture: Similar to massage, 61 percent of people experienced pain relief with acupuncture treatments (a form of Chinese medicine in which thin needles are inserted at specific points in the body to remove “energy blockages”). I used to have a huge needle phobia — this is one reason why I went to pharmacy school and not medical or nursing school! However, the needles used in acupuncture are extremely tiny and are barely felt by the patient. In fact, most people report acupuncture to be a relaxing and therapeutic experience. The research supports the use of acupuncture for pain relief, and it is becoming more and more common in the West as an alternative to habit-forming opiates. Results from several studies suggest that acupuncture may help ease chronic pain, such as low-back pain, neck pain, and osteoarthritis pain. It has also been shown to reduce the frequency of tension headaches and prevent migraine headaches. Chiropractic Care: Many people think of chiropractic treatment as “cracking the back” or realigning the spine. However, chiropractic care can take on several different forms, and involves looking at the whole body as an interconnected series of systems that all have an impact on each other. As such, finding alignment in one area of the body may release pain and stiffness in another part of the body. While opinions on the efficacy of chiropractic care vary amongst medical professionals, there is research supporting its use as an effective tool for pain relief. One study conducted at a hospital in the United Kingdom followed 30 patients with chronic low-back pain, for eight weeks. Twelve patients received treatment with medications at a hospital pain clinic, while 18 received chiropractic care. At the end of the eight week trial, the patients who received chiropractic care reported a greater reduction in pain compared to those who had received the standard pain medications. Rolfing: Also known as Structural Integration, rolfing is a form of holistic bodywork that uses hands-on manipulation of the body’s soft tissue to create balance and alignment in the body. It is used to relieve chronic pain, improve posture, and reduce stress. Rolfing focuses on fascia, which is the connective tissue that attaches to all of the muscles and organs of the body. The theory is that by releasing tension in this tissue, whole-body wellness can be achieved. Rolfing is performed by a licensed practitioner and is used for a variety of conditions, including chronic back pain, alignment of the spine, and breathing issues (such as asthma). Physical Therapy: The most well-researched and often prescribed treatment for chronic pain, physical therapy works to treat pain at its source through a variety of exercises and movements, as prescribed by a licensed physical therapist. Therapies that may be used include low-impact aerobic exercise, resistance training, and stretching. Additionally, the therapist may use heat or cold therapy to reduce inflammation, warm up the muscles before exercising, and aid in pain relief. Osteopathic Manipulative Treatment: Osteopathic Manipulative Treatment (OMT) is a set of hands-on techniques used by osteopathic physicians to diagnose, treat, and prevent illness or injury. To use OMT, a practitioner uses stretches, gentle pressure, and resistance to move a patient’s muscles and joints. This form of therapy can help treat arthritis, back pain, headaches, tennis elbow, digestive issues, and postural problems. Craniosacral Therapy: Typically used by osteopaths, chiropractors, and massage therapists, craniosacral therapy uses gentle pressure to manipulate the joints in the cranium or skull, parts of the pelvis, and the spine, to treat illness or injury. The light touch of the practitioner is said to release restrictions in the craniosacral system (which affects the pressure and circulation of the fluid around the brain and spinal cord) to improve the functioning of the central nervous system. This process is thought to relieve pain, and is often used in conjunction with other therapies, such as massage or chiropractic treatments. I have found that all of these forms of holistic treatment can be helpful for many people with pain related to Hashimoto’s. In fact, I have used acupuncture, chiropractic care, B6 supplementation, and nutrition in the past to help recover completely from a severe case of carpal tunnel. While there can be many sources of pain for those living with Hashimoto’s, finding your root cause can also bring relief from pain once your triggers have been identified and addressed. For many people, this will come in the form of dietary changes that allow the body to heal. However, there are a variety of natural supplements and healing tactics that can bring relief along the way! Wherever you are on your healing journey, I want you to be encouraged that you are not limited to a life of pain, nor required to suffer the side effects of addictive medications. There are many natural solutions to pain management that can help you feel better and live your life. In future articles, I will dive deeper into the common sources of pain for those with Hashimoto’s, to provide you with more information on your road to becoming pain free! In the meantime, I’d love to hear how these recommendations help you manage and treat your pain! P.S. For continued updates and interaction, please become a part of our Facebook community and sign up for my newsletter to have helpful information delivered right to your email inbox. You’ll also receive occasional updates about new research, resources, giveaways, and more! Symptoms of Fibromyalgia. WebMD. 2016. Available at: http://www.webmd.com/fibromyalgia/understanding-fibromyalgia-symptoms. Accessed June 17, 2016. Bazzichi L, Rossi A, Zirafa C, et al. Thyroid autoimmunity may represent a predisposition for the development of fibromyalgia? Rheumatol Int. 2010;32(2):335-341. doi:10.1007/s00296-010-1620-1. Shirzad N, Movassaghi S, Karmostaji H, Esfahanian F, Hemmatabadi M, Qorbani M. Association between fibromyalgia and thyroid autoimmunity. Endocrine Abstracts. 2015. doi:10.1530/endoabs.37.ep1004. Suk J, Lee J, Kim J. Association between Thyroid Autoimmunity and Fibromyalgia. Exp Clin Endocrinol Diabetes. 2012;120(07):401-404. doi:10.1055/s-0032-1309008. Benyamin R, Trescot AM, Datta S, Buenaventura R, Adlaka R, Sehgal N, et al. Opioid complications and side effects. Pain Physician. 2008 Mar;11(2 Suppl):S105-20. Adams R, White B, Beckett C. The Effects of Massage Therapy on Pain Management in the Acute Care Setting. Int J Ther Massage Bodywork. 2010; 3(1): 4–11. Wilkey A, Gregory M, Byfield D, McCarthy PW. A comparison between chiropractic management and pain clinic management for chronic low-back pain in a national health service outpatient clinic. J Altern Complement Med. 2008 Jun;14(5):465-73. doi: 10.1089/acm.2007.0796. Martin AR, Pinney S, Xie C, Herrick RL, Bai Y, Buckholz J RN, et al. Headache Disorders May Be a Risk Factor for the Development of New Onset Hypothyroidism. The Journal of Head and Face Pain. doi.org/10.1111/head.12943. Drug Overdose Deaths. Center for Disease Control and Prevention. https://www.cdc.gov/drugoverdose/data/statedeaths.html. Accessed March 22, 2019. Mohammed S, Yu J. Platelet-rich plasma injections: an emerging therapy for chronic discogenic low back pain. J Spine Surg. 2018 Mar; 4(1): 115–122. doi:10.21037/jss.2018.03.04. Note: Originally published in February 2017, this article has been revised and updated for accuracy and thoroughness. Pain and inflamation are closely related but GPs just treat the patients as neurotics and prescribe NSAIDS .i have been in lyrica for over 3 yrs i do exercise take supplements and try to manage thw diet but some timez its all very overwhelming.